From left, ATS Sr. Director Government Relations Gary Ewart; a Washington staffer; ATS President Monica Kraft, MD, chief of the Duke University Medical Center Division of Pulmonary, Allergy and Critical Care Medicine; ATS Board of Directors Member Michael Green, of the Carolinas Medical Center, and U.S. Rep. David E. Price (D-NC-4th). 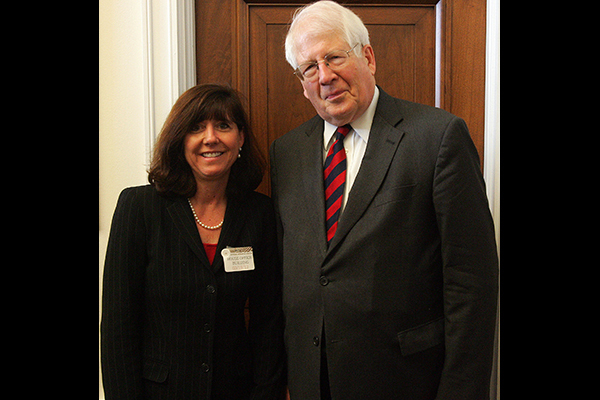 ATS President Monica Kraft, MD, chief of the Duke University Medical Center Division of Pulmonary, Allergy and Critical Care Medicine, and U.S. Rep. David E. Price (D-NC-4th). 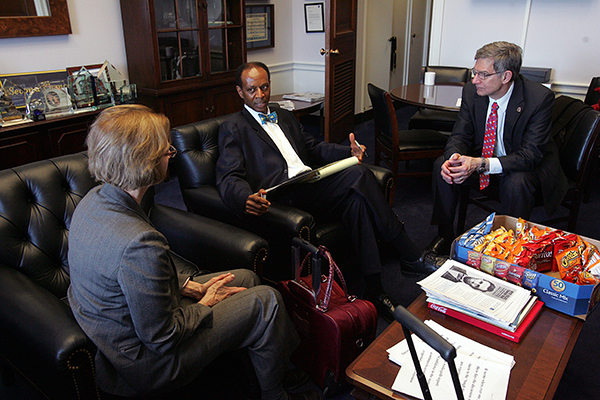 From left, ATS Past-President Nicholas Hill, MD, chief of the Pulmonary, Critical Care and Sleep Division at Tufts Medical Center in Boston; U.S. Sen. Elizabeth Warren (D-MA); and ATS Secretary-Treasurer Atul Malhotra, MD, medical director of the Sleep Disorders Research Program and clinical chief of the Division of Sleep Medicine at Brigham and Women’s Hospital. 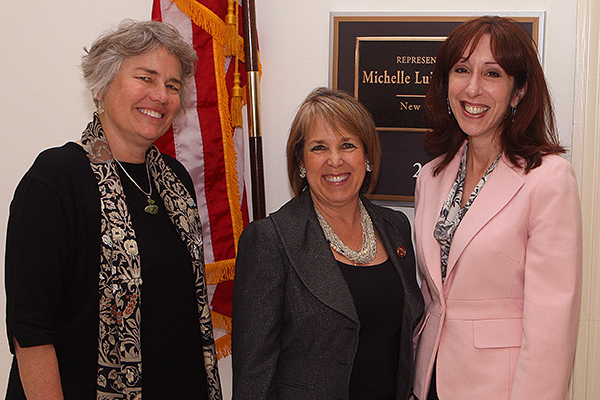 From left, ATS Board of Directors member Dona J. Upson, MD, of University of New Mexico and New Mexico Veterans Affairs Health Care System; U.S. Rep. Michelle Lujan Grisham (D-1st-NM); ATS Council of Chapter Representatives Secretary Robin L. Gross, MD, of Georgetown University Hospital. From left, Dale Dirks, President at Health and Medicine Counsel of Washington; ATS Health Policy Committee Member Nicola A. Hanania, MD, MS, of Baylor College of Medicine; ATS Member Tamas Dolinay, MD, of University of Tennessee College of Medicine; Laura Steves, PhD, executive director of the Asthma and Allergy Foundation of America Texas Chapter and ATS Public Advisory Roundtable partner; a Washington staffer; and Rep. Charles “Chuck” Fleischmann (R-3rd-TN). 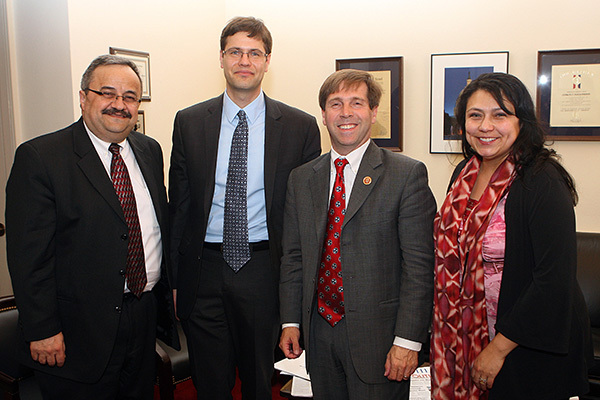 From left, ATS Health Policy Committee Member Nicola A. Hanania, MD, MS, of Baylor College of Medicine; ATS Member Tamas Dolinay, MD, of University of Tennessee College of Medicine; U.S. Rep. Chuck Fleischmann (R-3rd-TN); Laura Steves, PhD, executive director of the Asthma and Allergy Foundation of America Texas Chapter and ATS Public Advisory Roundtable partner. ATS President-Elect Patricia W. Finn, MD, chairman of the Department of Medicine at the University of Illinois College of Medicine at Chicago; Senior Policy Advisor Caleb Gilchrist, of the office of U.S. Rep. Danny K. Davis (D-7th-IL); and ATS 2010-11 President Dean E. Schraufnagel, MD, professor of medicine and pathology, director of the Pulmonary and Critical Care Fellowship, and vice-chair for Faculty Affairs-Department of Medicine at the College of Medicine at Chicago. 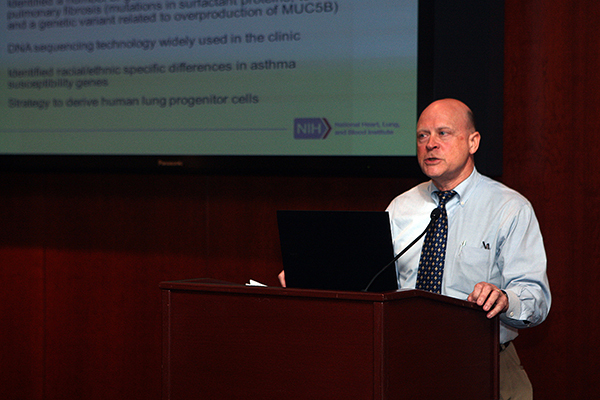 National Heart, Lung, and Blood Institute Health Scientist Administrator in the Division of Lung Diseases James P. Kiley, PhD. 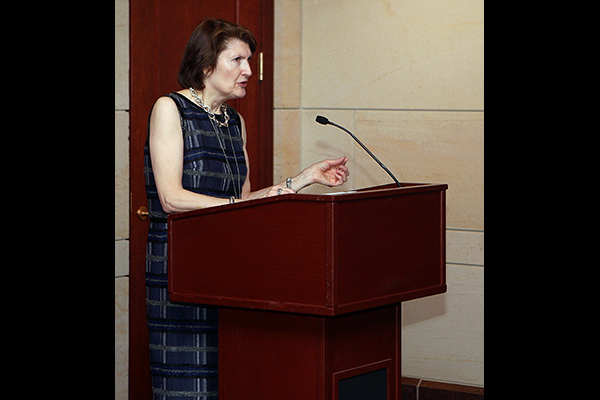 Sue Quantius, of the Subcommittee on Military Construction, Veterans Affairs, and Related Agencies, Committee on Appropriations. 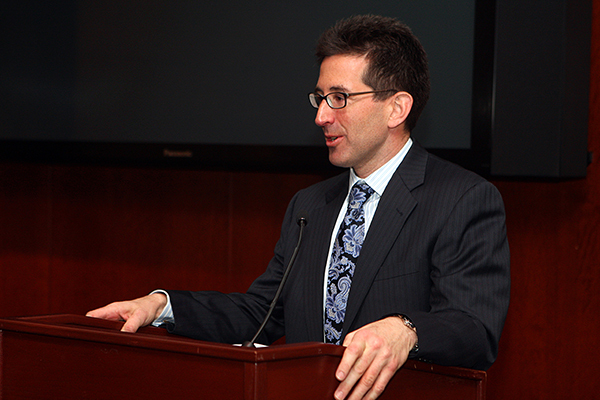 Erik Fatemi, of the Subcommittee on Labor, Health and Human Services, Education, and Related Agencies, Committee on Appropriations. 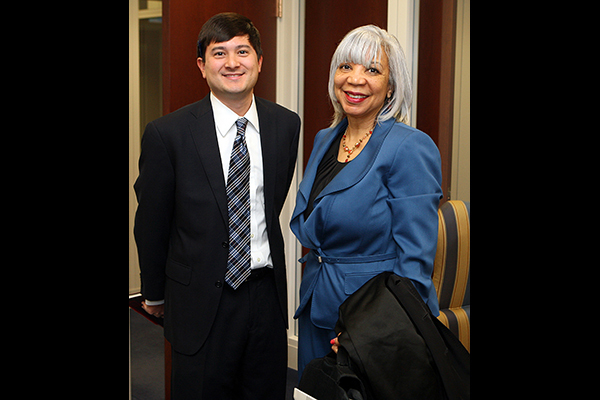 Legislative Assistant Michael Wong, of the Office of U.S. Sen. David Vitter (R-LA); Charlotte Collins, JD, vice president of policy and programs at the Asthma and Allergy Foundation of America. ATS officers and members from across the nation visited Washington, D.C., in late March to advocate for respiratory health as part of ATS Hill Day 2013. Several patient representatives from the ATS Public Advisory Round table joined in the effort. Participants focused on three issues: research funding, tobacco control, and a permanent fix to the Medicare sustainable growth rate (SGR) formula. 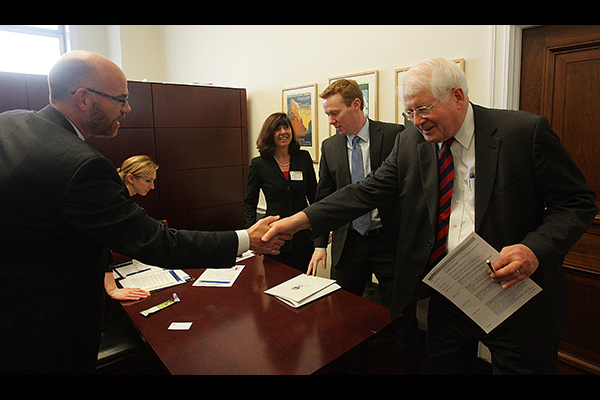 On research, ATS Hill Day participants expressed their strong support for funding at the National Institutes of Health, and urged Congress to provide additional funding to NIH. 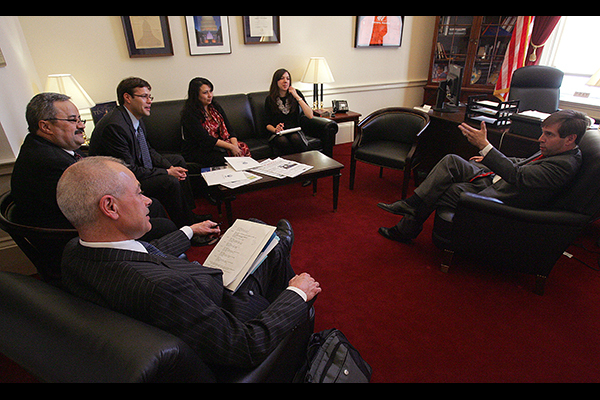 Much of the discussion focused on the adverse effects that sequestration cuts are having on research. The message on tobacco control was to strongly oppose legislation to exempt large cigars from Food and Drug Administration’s regulatory authority. Legislation has been introduced that would exempt large cigars (cigars that weigh more than 6 lbs/1000) from any FDA regulations. ATS advocates were equipped with candy flavored cigars—products clearly made for and marketed to kids—as examples of products that would be unregulated if the legislation was enacted.